As with the Sony Cyber-shot DSC-RX1, the Sony SLT-A99 inaugurates a new 24Mpix Exmor CMOS full-frame sensor. The sensor resolution, rather more modest than that of the Nikon D800, along with its wide sensitivity range – from 50 to 25600 ISO – should deliver good low-light results as well as a good dynamic range, which we expect our tests to confirm. 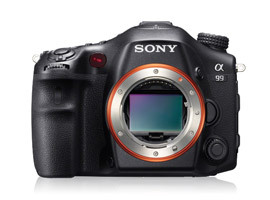 Also worth noting is that the SLT-A99’s sensor moves to compensate for camera shake or vibrations caused by the photographer’s motions, and provides integrated mechanical image stabilization. This is both significant and rare for a camera equipped with a full-frame sensor, and means that the vast majority of Sony lenses will benefit from image stabilization. As with the rest of the SLT line, the A99 is equipped with a translucent mirror that diverts a portion of the light entering the lens to the video system to feed the electronic viewfinder or screen. Thus it is a video DSLR, and because of this, it doesn’t have an optical viewfinder — which may cause some problems for photographers who are used to using traditional DSLR viewfinders. To offset this sacrifice, the camera gains a powerful autofocus – an AF hybrid high-quality 2.35 Mpix XGA OLED viewfinder found on NEX-7 and SLT-A77 models (as well as on the Fuji X-E1). The image is beautiful and smooth, with vivid colors, and the viewfinder offers the additional advantages of covering 100% of the framed image, while offering white balance validation and exposure compensation. Another strength of Sony SLT DSLRs is their high-performance video mode, and the SLT-A99 is no exception to the rule: Full HD in 50p for a bit rate of 28 Mbps in AVCHD V2.0 format. It also possesses a 24p mode with cinematic rendering. Thanks to its Translucent Mirror Technology system, the DSLR provides improved phase detection autofocus, and video with continuous subject tracking (customizable on three levels — a small plus that puts SLT cameras among the favorite choices of videographers). Its large sensor size should produce velvety bokehs. The key argument in favor of the Alpha 99, and thus its full-frame sensor, is undoubtedly its responsiveness: 10 fps burst shooting, an autofocus with 19 focus points (11 cross-type) and 102 assist points, and tracking with subject recognition. Sony has also adopted a muscular shutter that can achieve 1/8000s and is good for 200,000 cycles. The SLT-A99 will be available this October as body-only for $2,800, or in other words, the same price as the Nikon D800, and a few dozen euros less than the Canon EOS 5D Mark III.